When the Big 12 recently trimmed its list of expansion candidates, East Carolina Pirates didn’t make the cut. Based on the Pirates’ play this afternoon, the league might eventually regret that decision. 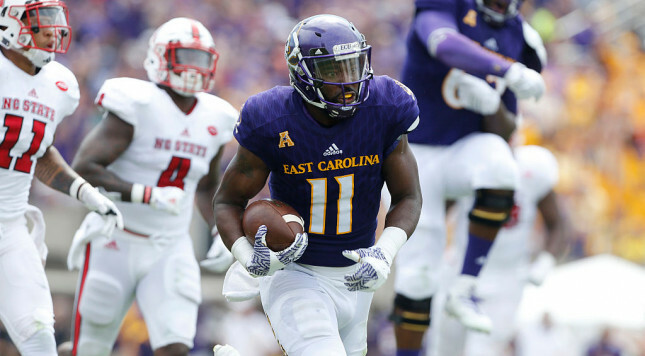 Powered by a high-octane offense, East Carolina defeated NC State 33-30 to move to 2-0. Make no mistake about it: the Pirate offense played a fantastic game. Quarterback Phillip Nelson picked right where he left off last week, completing 33 of 43 passes for 297 yards and a touchdown. Change of pace QB James Summers added a nice wrinkle to the offense, rushing 6 times for 41 yards, highlighted by a nifty TD run immediately after Nelson was knocked out of the game on a late hit. He also had the longest reception of the day with 39-yard catch in the first quarter. As well as the offense played, you’ve got to tip your cap to the East Carolina defense in this contest. Sure, they gave up 497 yards, but the Pirate defense made the plays when it needed to, holding the Wolfpack to just 4 of 11 on third down and 0 for 1 on fourth down conversions. It also kept in NC State out of the red zone on the first two drives of the game, forcing the ‘Pack to try long field goals, which they ended up missing. Those stops ultimately led the to the difference in the ball game. So, what does this impressive victory mean for the Pirates? Simply put: East Carolina made a statement in this contest that it’s as good of an expansion candidate as anyone else out there. While the Big 12 will ultimately make its decision based upon money, the Pirates proved that they could make the conference better. With the win over North Carolina State, East Carolina has posted a victory over an ACC school in each of the last four seasons, with two wins in both 2013 and 2014. The fact they beat Power 5 teams consistently would make them a welcomed addition to the Big 12 conference. They are definitely a tougher opponent than both Kansas and Iowa State are right now. Just ask NC State, Virginia Tech, or North Carolina. In other words: don’t be surprised if the Pirates win the East Division in the American Athletic Conference this season.